Hyds, this one's for you. 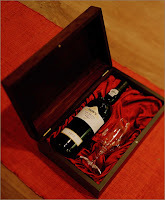 If I'm not mistaken, IMX offered a 1972 Colheita wine from Portugal to commemorate Bae Yong Joon's birthday in 2006. because of him, we are all interested in wine tasting, collecting or- like you-wine making . I took the liberty to collect some information for us to sip on. Here's some info on Colheita wine, and Port : Dow’s ages some of its best Ports for many years in seasoned oak casks in its ancient cellars in Vila Nova de Gaia. This prolonged time in barrel ensures that the wines take on soft almond and walnut aromas, losing the intense red colour of its youth but gaining immense delicacy, richness and profound intensity of flavour. The word ‘Colheita’ means ‘harvest’, for Port this word is used to describe a wine from a single year that has been aged in wood for a minimum of 7 years. If there are some -like me- wondering what are Port Wines, here's some info on that : Port wine [also known as Vinho do Porto, Oporto, Porto, and often simply Port] is a Portuguese, fortified wine from the Douro Valley in the Northern provinces of Portugal. It is typically a a red wine, but also comes in dry, semi-dry and white varieties. It is often served as a dessert wine. Under European Union guidelines, only the product from Portugal may be labeled as Port. In the United States, Federal law mandates that the Portuguese-made product be labeled Porto or Vinho do Porto. Hyds, Congratulations on your wine making venture ! Don't forget to save some for me, who knows...I might show up on your doorstep someday [The Powers Above willing...] and you and I will drink a toast to BYJ's health ! Thanks Myoce!!! Oh that was great!! They bottled a wine for him! He must have kept his Port then since hubby still has his. Hi parents bought it the day he was born. Whether it's still drinkable who knows. Wow, that's an interesting practice Hyds...you'll have to keep it safe. I'd be afraid it would get broken !